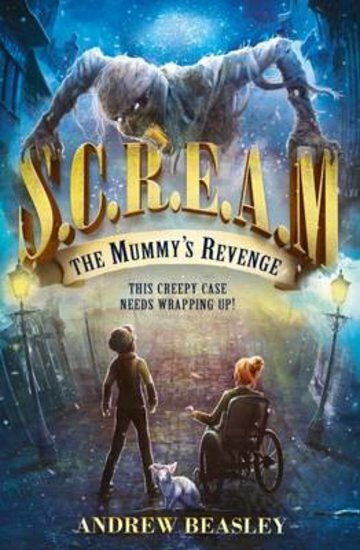 Giggles, frights and a rotting mummy on the loose in Edinburgh: it’s the best thing since Goosebumps! (But much closer to home. So lock all your doors.) In Edinburgh’s dark, winding alleys, a burglar is on the prowl. But this is no ordinary thief: he’s three thousand years old and risen from the grave! Even worse, he doesn’t just want your GameBoy – he wants revenge. (Although he’ll also take your jewels, thanks very much.) So… how do you stop a crook who’s so dead you can’t even kill him? There’s only one crime-fighting force who can deal with a menace like this. Billy Flint and Charley Steel – aka S.C.R.E.A.M. : top-secret investigators of Supernatural Crimes, Rescues, Emergencies and Mysteries. If there’s a mummy at your door, you know who to call.